Rudolf Wissell (8 March 1869 – 13 December 1962) was a German politician in the Social Democratic Party of Germany (SPD). During the Weimar Republic, he held office as the Minister for Economic Affairs and Minister for Labour. The Social Democratic Party of Germany is a social-democratic political party in Germany. The Weimar Republic is an unofficial historical designation for the German state from 1918 to 1933. The name derives from the city of Weimar, where its constitutional assembly first took place. The official name of the republic remained Deutsches Reich unchanged from 1871, because of the German tradition of substates. Although commonly translated as "German Empire", the word Reich here better translates as "realm", in that the term does not in itself have monarchical connotations per se. The Reich was changed from a constitutional monarchy into a republic. In English, the country was usually known simply as Germany. Göttingen is a university city in Lower Saxony, Germany. It is the capital of the district of Göttingen. The River Leine runs through the town. At the start of 2017, the population was 134,212. 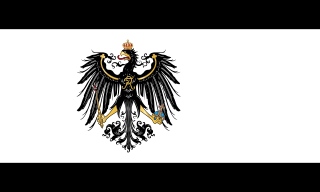 The Kingdom of Prussia was a German kingdom that constituted the state of Prussia between 1701 and 1918. It was the driving force behind the unification of Germany in 1871 and was the leading state of the German Empire until its dissolution in 1918. Although it took its name from the region called Prussia, it was based in the Margraviate of Brandenburg, where its capital was Berlin. The Province of Hanover was a province of the Kingdom of Prussia and the Free State of Prussia from 1868 to 1946. A grenadier was originally a specialized soldier, first established as a distinct role in the mid-to-late 17th century, for the throwing of grenades and sometimes assault operations. 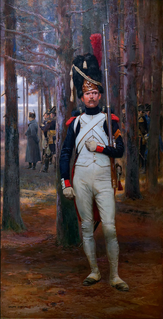 At that time grenadiers were chosen from the strongest and largest soldiers. By the 18th century, dedicated grenade throwing of this sort was no longer relevant, but grenadiers were still chosen for being the most physically powerful soldiers and would lead assaults in the field of battle. Grenadiers would also often lead the storming of fortification breaches in siege warfare, although this role was more usually fulfilled by all-arm units of volunteers called forlorn hopes, and might also be fulfilled by sappers or pioneers. Poznań is a city on the Warta River in west-central Poland, in the Greater Poland region and is the fifth-largest city in Poland. It is best known for its renaissance Old Town and Ostrów Tumski Cathedral. Today, Poznań is an important cultural and business centre and one of Poland's most populous regions with many regional customs such as Saint John's Fair, traditional Saint Martin's croissants and a local dialect. Kiel is the capital and most populous city in the northern German state of Schleswig-Holstein, with a population of 249,023 (2016). The General Commission of German Trade Unions was an umbrella body for German trade unions during the German Empire, from the end of the Anti-Socialist Laws in 1890 up to 1919. In 1919, a successor organisation was named the Allgemeiner Deutscher Gewerkschaftsbund, and then in 1949, the current Deutscher Gewerkschaftsbund was formed. Berlin is the capital and largest city of Germany by both area and population. Its 3,723,914 (2018) inhabitants make it the second most populous city proper of the European Union after London. The city is one of Germany's 16 federal states. It is surrounded by the state of Brandenburg, and contiguous with its capital, Potsdam. The two cities are at the center of the Berlin/Brandenburg Metropolitan Region, which is, with 6,004,857 (2015) inhabitants and an area of 30,370 square km, Germany's third-largest metropolitan region after the Rhine-Ruhr and Rhine-Main regions. Vorwärts is a newspaper published by the Social Democratic Party of Germany (SPD). Founded in 1876, it was the central organ of the SPD for many decades. Following the party's Halle Congress (1891), it was published daily as the successor of Berliner Volksblatt, founded in 1884. Today it is published monthly, mailed to all SPD members. The Reichstag was the Parliament of Germany from 1871 to 1918. Legislation was shared between the Reichstag and the Bundesrat, which was the Imperial Council of the reigning princes of the German States. 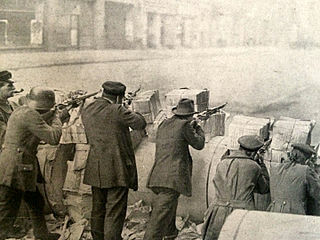 The German Revolution or November Revolution was a civil conflict in the German Empire at the end of the First World War that resulted in the replacement of the German federal constitutional monarchy with a democratic parliamentary republic that later became known as the Weimar Republic. The revolutionary period lasted from November 1918 until the adoption in August 1919 of the Weimar Constitution. A soviet republic is a republic in which the government is formed of soviets and politics are based on soviet democracy. One result of his arguments was the conclusion of the Stinnes-Legien Agreement, which meant that the employer's associations for the first time recognised the trade unions as the representatives of the workers. In January 1919, Wissel was elected for the SPD to the National Assembly. One and a half years later, in June 1920, he was elected to the first Reichstag of the Weimar Republic. He was re-elected seven times from 1924 to 1933, and was a member of the German parliament for almost exactly 13 years, from June 1920 to June 1933. The important parliamentary activities that Wissell participated in during his time in the Reichstag included the vote on the Enabling Act in March 1933: here, he was one of 94 members who voted against the law that created the legal foundations for the Nazi dictatorship. It was passed by 444 votes to 94. Today, his name is carried by the Rudolf-Wissell-Brücke (de ) between Charlottenburg und Charlottenburg-Nord, at 960 meters the longest road bridge of Berlin, as well as the Rudolf-Wissell-Siedlung (Rudolf Wissell Settlement) in Staaken, built in the 1970s, and the Rudolf-Wissell-Grundschule (Rudolf Wissell Primary School) in Gesundbrunnen. Friedrich Ebert was a German politician of the Social Democratic Party of Germany (SPD) and the first President of Germany from 1919 until his death in office in 1925. Philipp Heinrich Scheidemann was a German politician of the Social Democratic Party of Germany (SPD). On 9 November 1918, in the midst of the German Revolution of 1918–1919, he proclaimed Germany a republic. Later, beginning in the early part of the following year, he became the second head of government of the Weimar Republic, acting in this post for 127 days. Gustav Adolf Bauer was a German Social Democratic Party leader and 11th Chancellor of Germany from 1919 to 1920. He served as head of government for a total of 219 days. Prior to becoming head of government, Bauer had been Minister of Labour in the first democratically elected German cabinet. After his cabinet resigned in March 1920, Bauer served as vice-chancellor, Minister of Transportation, and Minister of the Treasury in other cabinets of the Weimar Republic. Hermann Müller (help·info) was a German Social Democratic politician who served as Foreign Minister (1919–1920), and twice as Chancellor of Germany in the Weimar Republic. In his capacity as Foreign Minister, he was one of the German signatories of the Treaty of Versailles in 1919. Otto Braun was a German Social Democratic politician who served as Prime Minister of Prussia for most of the time from 1920 to 1932. After the Nazis seized power in 1933, Braun went into exile in Switzerland. Wilhelm Martin Philipp Christian Ludwig Liebknecht was a German socialist and one of the principal founders of the Social Democratic Party of Germany (SPD). His political career was a pioneering project combining Marxist revolutionary theory with practical legal political activity. Under his leadership, the SPD grew from a tiny sect to become Germany's largest political party. He was the father of Karl Liebknecht and Theodor Liebknecht. Paul Hirsch was a German politician and a member of the Social Democratic Party who served as Prime Minister of Prussia from 1918 to 1920. Otto Wels was the chairman of the Social Democratic Party of Germany (SPD) from 1919 and a member of parliament from 1920 to 1933. Rudolf Breitscheid, was a leading member of the Social Democratic Party and a delegate to the Reichstag during the era of the Weimar Republic in Germany. Ernst Rudolf Johannes Reuter was the German mayor of West Berlin from 1948 to 1953, during the time of the Cold War. The Federal Ministry for Labour and Social Affairs (BMAS) is a federal ministry of the Federal Republic of Germany headed by the Federal Minister of Labour and Social Affairs as a member of the Cabinet of Germany (Bundesregierung). Its first location is on Wilhelmstrasse in Berlin, the second in Bonn. Hans Böckler was a German politician and trade union leader. He was the most influential re-founder of the unions in post-war Germany and became the first president of the German Trade Union Confederation. Robert Fischer was a notable German unionist and social democratic politician. Hans Staudinger was a politician of the Social Democratic Party of Germany (SPD) and an economist, as well as a secretary of state in the Prussian trade ministry from 1929 to 1932. From November 1932 to June 1933 he was a Social Democrat member of the Reichstag. Arthur Crispien was a German Social Democratic politician. Cabinet Müller I or the first Cabinet Müller was the third democratically elected government of Germany and the second in office after the Weimar Constitution came into force in August 1919. It was named after the new Chancellor (Reichskanzler) Hermann Müller of the Social Democratic Party of Germany (SPD). The cabinet was based on the same three centre-left parties as the previous one: the SPD, the German Center Party (Zentrum) and the German Democratic Party (DDP). It was formed in March 1920 after the resignation of the Cabinet Bauer. The Cabinet Müller resigned in reaction to the outcome of the Reichstag elections of 6 June 1920. Johannes Stelling was a German political activist who became a leading SPD politician during the Weimar years. He served between 1921 and 1924 as First Minister (Ministerpräsident) of Mecklenburg-Schwerin. Kurt Rosenfeld was a German lawyer and politician (SPD). He was a member of the national parliament ("Reichstag") between 1920 and 1932. Fritz Soldmann was a German politician of the Independent Social Democratic Party (USPD) and later the Social Democractic Party (SPD). August Enderle was a German socialist politician, trades unionist, journalist and author. 1 2 3 4 5 6 7 8 9 10 11 12 "Biografie Rudolf Wissell (German)". Deutsches Historisches Museum. Retrieved 15 February 2016. Wikimedia Commons has media related to Rudolf Wissell .